Donwood Community Aged Care Services in Croydon is adding and refurbishing 35 rooms with substantial upgrades to provide a much needed boost to aged care facilities in the area which has a growing ageing population. 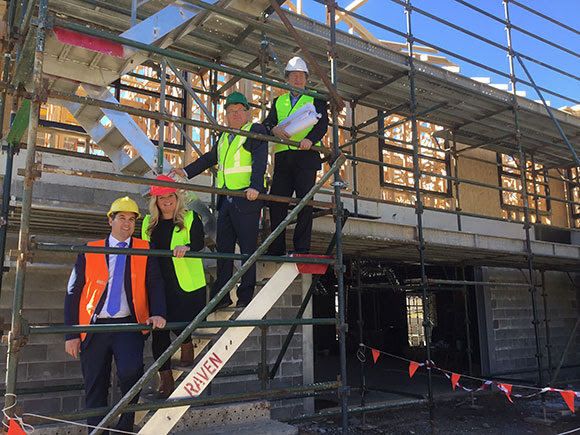 When the project is completed in October 2017, Donwood will be one of the best equipped aged care facilities in Victoria and will have accommodation for 105 residents, all in the their own spacious rooms. Established twenty five years ago by a Voluntary Board of Management, Donwood Community Aged Care Services conducted a progress inspection of its $9 million extension with architect Robert Caulfield. Richard Carter, Chairman of Donwood with Architect Robert Caulfield on the site inspection at Donwood Community Aged Care Services in Croydon. Chairman of Donwood Community Aged Care Services Inc. Richard Carter said, the site was established in 1991 and has continued to expand with the increase in population to fulfil the increasing need for quality aged care. Chief Executive Officer Natasha Wilkinson said the services offered by Donwood Community Aged Care Services were designed around individual needs, ranging from the design of the rooms with light filled views to gardens and access to large open areas and gardens. Ms Wilkinson said, “The popular Donwood Day Centre is designed for individuals who live at home by themselves or with a carer, but would like to participate in outside activities. “The Day Centre offers individuals an opportunity for social interaction involving activities that promote mental and physical stimulation as well as access to an outpatient physiotherapy clinic creating flexible options for older residents in the area. “Donwood also provides local residents respite care offered to individuals living at home with their carer or by themselves and feeling they need a ‘break’ which is an important community service. 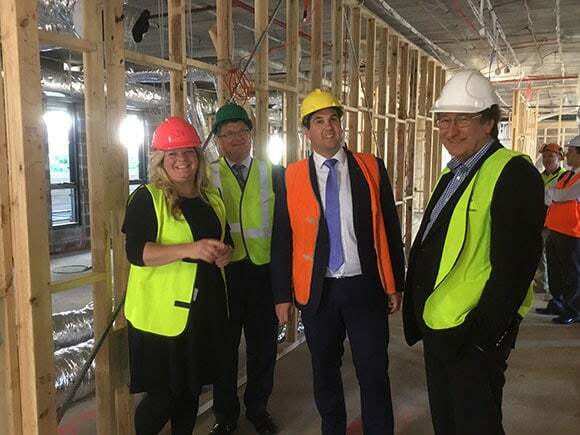 Inspection of the interior of the new extension at Donwood Community Aged Care Services in Croydon. Michael Sukkar MP, Federal Member for Deakin with Architect Robert Caulfield. Architect Robert Caulfield, a specialist in aged care design from Caulfield Krivanek Architecture, said the design and layout of the new thirty five room upgrade and extension included a special use of colour and textures to reinforce safety and stimulate senses. The new facility will also have a large function area for use by residents, guests, community groups and the general community.